With over 20 years experience as a Brisbane and Gold Coast Builder, Chris Eades and his team are more than qualified to design and construct any custom luxury home to suit any one’s lifestyle and design brief. Our easy to follow process is diligent and our systems are streamlined to ensure your project runs smoothly and you move in on the date promised from the start of the job. 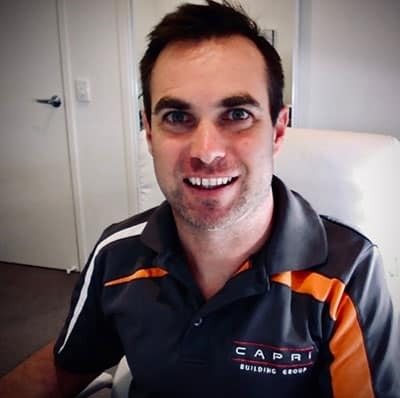 Having founded Capri Building Group after an extensive career in the building industry, Chris has found himself starting out as a carpenter and joiner, progressing his way through to managing teams of other tradesmen in his own venture. Following this, Chris progressed into project management where he learnt how to manage teams of suppliers, tradesmen and liaise with developers as well as the individual clients. After a break from the construction Industry, Chris ventured into the world of finance where he created and managed his own fund on the worlds financial markets. Chris then was offered a position as a project manager for a multinational company where he progressed to manage QLD and NSW. In this role he learned how to manage people and create a paperless office. It’s with this passion that he wanted Capri Building Group to also become a paperless office. With systems in place to record all communication and give all parties access throughout the build, it ultimately gives clients control of their budget and a move in date, even before the job has begun. Chris has also managed other building companies in the past and he has learned from each venture, his biggest positive being that he wanted to create seamless communication and transparency to his clients, suppliers and professional tradesmen.